Does it Add Value to Do a Room Addition? Question: Does it Add Value to Do a Room Addition? A reader asks: "My husband and I love our little house. It's a 2-bedroom house, pretty small. We do not want to move, but we are running out of room. We have a baby on the way; she's due this fall. My husband's idea is to convert our garage into a nursery. It seems kind of cold and damp out there to me. Is that a good idea to convert a garage? Or should we add on to the house, maybe move out a wall in the back yard? Does it add value to do a room addition? We obviously don't know where to start or even if we should start. Please help. Cindy." Answer: The first thing I suggest, Cindy, is walk around your neighborhood. Look at other homes in your area. Do those homes have additions? Look them up on Google so you can see back yards. You do not want to over-improve your home. If most of the homes in your neighborhood are, say, 900 square feet, you don't want to make yours a whole lot bigger because you won't get the money back. You don't want to turn your home into a unique house. If you find a few homes where the owners had converted the garage, take a picture of the conversion. Upload it to your computer and study it. Does it look good to you or does it look weird? Most of them look weird. If you can tell that the garage was converted, it looks weird. Also, if you convert the garage, you no longer have a garage. Which might be a big deal to you but the next buyer may not like it, and might not buy your home because there is no garage. Converting a garage is not the same thing as a room addition because the garage is already there. You will have to decide how to close off the door, and sometimes that previous door is hard to hide. That's because there is a microbeam overhead and studs on the sides that might have been stationary for years. Movement can cause cracks. You might have to sheetrock the whole wall. The slab might not be level or may contain cracks. You might have to pour a new slab to level it. When I built a garage, the cost of the slab was about 30% of the construction costs. If your water heater or furnace is the garage, those appliances will need to be relocated elsewhere. Some people put walls around them but you'll need access, and that takes up space. Do you really want a water heater in your family room? Plus, you'll need to figure out how to cool and heat the space. You really should get a permit. Depending on your city code requirements, you might need to install special footings and windows of a certain size, which adds to the complexity and cost. Not every garage has electrical. Some cities require that you dig 2-foot ditches to run electrical to a garage. Plumbing and draining can be more of an issue if you need to put in a bath. Check with your city planning department before buying all of your building materials. When all is said and done, you might have actually lost value rather than add value to your home. You might want to check with a real estate agent and get a professional opinion first. There is a small Chinese restaurant I frequent in Sacramento that completed an interesting remodel. The building sat squarely in the middle of a lot. Instead of adding on to one side, the owners added more square footage to the entire perimeter. This way, only part of the restaurant was closed at a time during renovation. It also goes to show it's not that expensive to knock down a wall and move it out. Mom-and-Pop restaurants are not known for expensive splurges. Some people convert a covered patio into an enclosed area. Many homes that I see with converted patios eventually get converted back. The floors slope, they are often drafty and they take away your outdoor space. If you don't have construction knowledge, then hire a general contractor. Make sure the contractor takes out a building permit and finalizes it. If you do not, it is possible that the work will not be completed to code and, when you sell down the road, the square footage might not be considered for the appraisal. It's generally a good idea to keep the floor at the same level as the floor throughout the rest of your home. This means if you have a raised foundation, the room addition should have a raised foundation. Extend the roof and consider raising or lowering the roof line for an improved appearance. Run utilities to the space. Frame out the space with studs, top and sill plates. Adding square footage by constructing a room addition such as a family room or another bedroom will add to the value of your home as long as it's not a white elephant in the neighborhood. 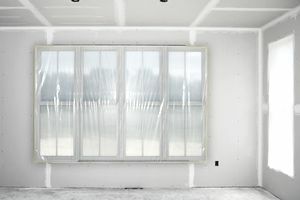 Converting a space that is used for one purpose into a space for another purpose is not the best type of room addition, and may actually cause your home to lose value.